Date Night? Birthday Party? Enjoy the Fun! The beautifully landscaped 18-hole miniature golf course, known as Mt. Hyatt, boasts a picturesque waterfall, wandering streams and stepping ponds. There are 18 holes, 9 of which are handicapped accessible. The generous, playable greens bring together the elements of both chance and challenge, making play enjoyable for all age groups! The mini golf course, located near the clubhouse and driving range, is easily accessible for children and families. It is also available for birthday parties and other special occasions. To schedule miniature golf tournaments or parties at Mt. Hyatt 18-hole course please stop by the restaurant and fill out a form to hold your date. Have your unforgettable birthday party with us! 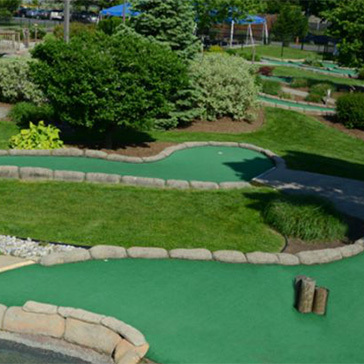 Our packages combine miniature golf with food and drinks. We arrange parties for children and adults. Packages start at $20 per person, which includes 18-holes of miniature golf, choice of hot dog, hamburger or grilled cheese, soda/water and chips. Upgrades include driving range tokens, supervised professional golf instruction and more! To book your party call 732-669-9024.